Excel formula auditing taken to the next level! 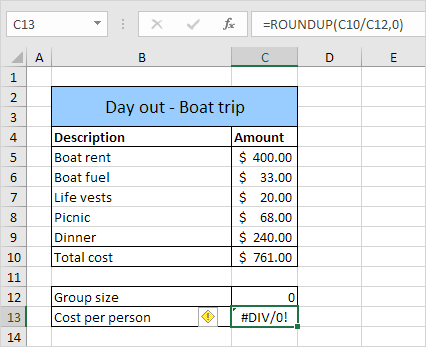 Formula auditing in Excel allows you to graphically display the relationship between formulas and cells. Error Checking – Checks the active worksheet for errors. If your worksheet contains errors then the Error Checking dialog box is displayed. Trace Precedents – Draws tracer arrows from the cells that supply values directly to the formula in the active cell. You can press this button multiple times to see additional levels. Remove Precedent Arrows – Removes tracer arrows from one level of dependents on the active worksheet. Trace Dependents – Draws a tracer arrow to the active cell from formulas that depend on the value in the active cell. You can press this button multiple times to see additional levels. Remove Dependent Arrows – Removes tracer arrows from one level of dependents on the active worksheet. Remove All Arrows – Removes all tracer arrows from the active worksheet. Trace Error – Traces cells with error values. If the active cell contains an error value then tracer arrows are drawn to the cells that may have caused the error. Circle Invalid Data – Draws red circles around any cells that contain values that are outside the limits you set by using Data Validation. To see what data restrictions and messages are in effect for a cell, click the circled cell, and then select (Data > Validation). Clear Validation Circles – Removes circles around cells that contain values outside the limits you set by selecting (Data > Validation). To see what data restrictions and messages are in effect for a cell before you remove circles, click the circled cell, and select (Data > Validation). Show Watch Window – Displays the Watch Window that can be used to keep a close eye on certain formulas as you make changes to other parts of the worksheet. 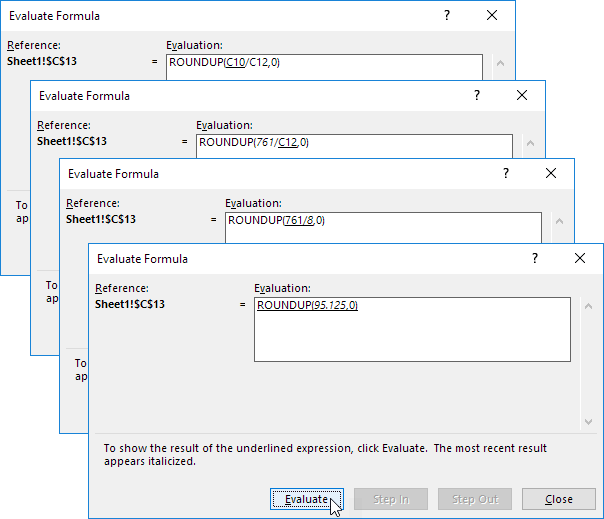 Evaluate Formula – Displays the (Tools > Formula Auditing > Evaluate Formula) dialog box that enables you to evaluate parts of a formula. The example below helps you master Formula Auditing quickly and easily. You have to pay $96.00. 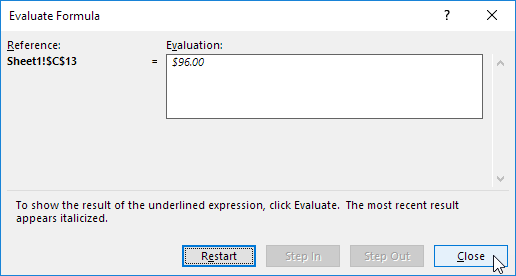 To show arrows that indicate which cells are used to calculate this value, execute the following steps. 2. On the Formulas tab, in the Formula Auditing group, click Trace Precedents. As expected, Total cost and Group size are used to calculate the Cost per person. 3. Click Trace Precedents again. As expected, the different costs are used to calculate the Total cost. To remove the arrows, execute the following steps. 1. On the Formulas tab, in the Formula Auditing group, click Remove Arrows. To show arrows that indicate which cells depend on a selected cell, execute the following steps. 2. On the Formulas tab, in the Formula Auditing group, click Trace Dependents. As expected, the Cost per person depends on the Group size. By default, Excel shows the results of formulas. To show the formulas instead of their results, execute the following steps. 1. On the Formulas tab, in the Formula Auditing group, click Show Formulas. Note: instead of clicking Show Formulas, you can also press CTRL + (`). You can find this key above the tab key. To check for common errors that occur in formulas, execute the following steps. 1. Enter the value 0 into cell C12. 2. On the Formulas tab, in the Formula Auditing group, click Error Checking. Result. Excel finds an error in cell C13. The formula tries to divide a number by 0. To debug a formula by evaluating each part of the formula individually, execute the following steps. 2. On the Formulas tab, in the Formula Auditing group, click Evaluate Formula. 3. Click Evaluate four times. 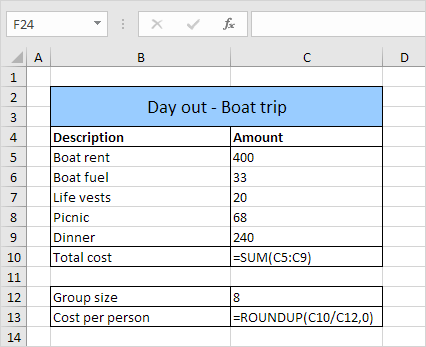 Excel shows the formula result.